Marriages and baptisms at South Hampton, N.H. 1743-1801: From a ms. copy of the church record, Boston: Geo A. Gordon, (1899) , p. 9. COLBY FAMILY & OTHERS at http://freepages.genealogy.rootsweb.com/~colby/colbyfam, /d184.html. "New Hampshire Marriages, 1720-1920," database, FamilySearch (https://familysearch.org/ark:/61903/1:1:FDKH-1JY : 31 December 2014), James Benson and Nancy Colby, 20 May 1830; citing reference P 87; FHL microfilm 16,100. 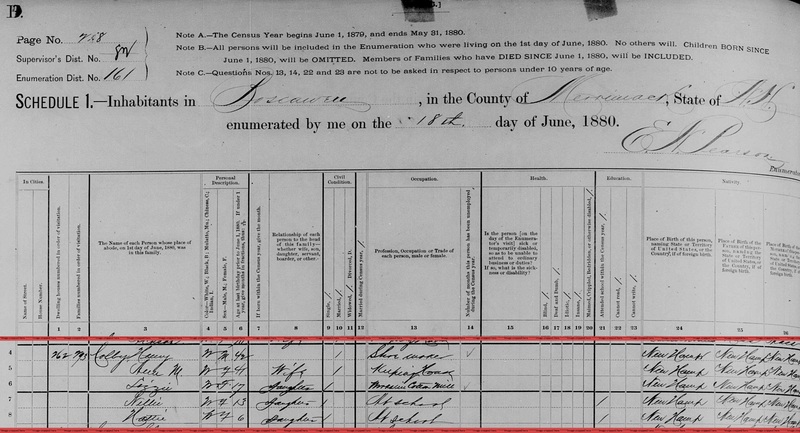 "United States Census, 1850," database with images, FamilySearch (https://familysearch.org/ark:/61903/1:1:MWZV-984 : 9 November 2014), Jas Benson, Bow, Merrimack, New Hampshire, United States; citing family 114, NARA microfilm publication M432 (Washington, D.C.: National Archives and Records Administration, n.d.). Harrison Colby, A genealogy of the descendants of Abraham Colby and Elizabeth Blaisdell, his wife, who settled in Bow in 1768, , at https://archive.org/details/genealogyofdesce00colb . Concord, N.H.: Printed by the Republican Press Association, (1895) Microfilm #896944 of the Family History Library, Salt Lake City, Utah, p. 105. 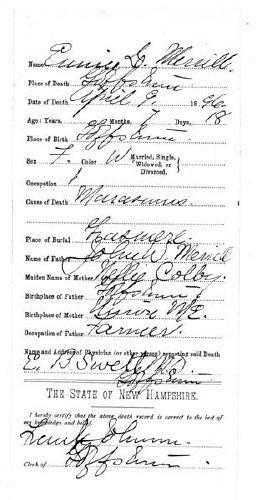 COLBY FAMILY & OTHERS at http://freepages.genealogy.rootsweb.com/~colby/colbyfam, citing FHL Number 1000976; Marriage: Hephsibah WOODBURY, Date: 2 Aug 1827; Recorded in: Birth and Marriage Index for New Hampshire. Caleb Stark, History of the Town of Dunbarton, Merrimack County, New-Hampshire, from the Grant by Mason's Assigns in 1751 to the Year 1860, , at https://books.google.com/books?id=Cv7hcQ8-5bIC . Concord: G. Parker Lyon, (1860) , p. 247. COLBY FAMILY & OTHERS at http://freepages.genealogy.rootsweb.com/~colby/colbyfam, /d187.html. 1900 United States. Census Office. 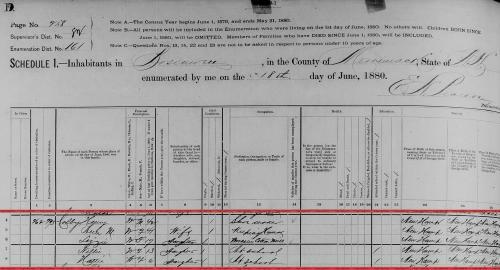 12th census, 1900 population census schedules, Washington, District of Columbia: Bureau of the Census Micro-Film Laboratory, ([197-]) , Census Place: Kinyon, Cass, North Dakota; Roll: 1227; Page: 9A; Enumeration District: 0036; FHL microfilm: 1241227. 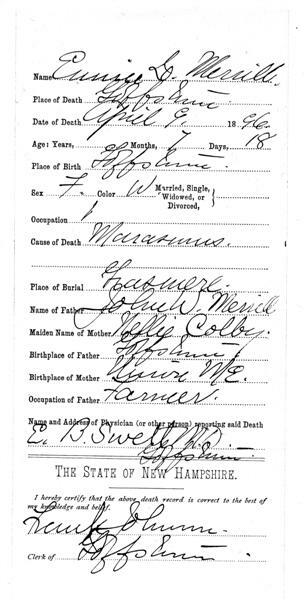 "New Hampshire, Death Records, 1654-1947," index and images, FamilySearch (https://familysearch.org/pal:/MM9.1.1/FSKY-C2C : accessed 30 Nov 2012), Nellie A Davis, Dec 1896.